These are my essentials I packed in a backpack for my international trip to Karachi, Pakistan from Atlanta, Georgia with just my baby and I! Hope this helps those considering traveling there! I didn’t bring my stylish diaper bag because it wasn’t a backpack, but rather put my belongings in a sturdy grey backpack of my husband’s. Traveling alone with a toddler, I believe hands-free was the way to go. Dollar Store toys/books – test out on baby first to see if she even likes them! I know some say to hide the goodies till the flight, but I like to know if my little one will even like what’s packed! Medicine for you too not just baby – i.e. Adult tylenol/Adult medicine for stomach bug, etc – I ate an egg on board and my stomach was unhappy to say the least. Avoid questionable foods like egg and fish on board! from previous travels, but I Loved this sign! Hoodie sweater for you and hoodie for baby as you never know what weather is like on board. Traveling to Pakistan the airline was warm, but on the way back to USA was cooold! this Buckley toy on Amazon was nice! Low Expectations – don’t expect your little one to magically sleep the whole flight and be prepared to entertain them! My daughter didn’t sleep for the first hours and was too excited with her surroundings! Make sure vaccinations are up to date by visiting CDC site here and consulting pediatrician. Try to travel light (This is much easier said than done!). I took a backpack stuffed with diapers, wipes, snacks, clothes for my daughter and I. As much as I tried to pare down to essentials, my backpack still felt like a brick! Quadruple check that your stroller will reach you at your gate. Additionally, You may not have a gate when you step off the plane, so check before you leave the plane and as you step off the plane. In my connection city of Istanbul, Turkey, I was disoriented and the last one off the plane. I didn’t see my stroller right outside the plane and boarded a bus, thinking my stroller would be at a further gate – Alas, this was not the case. When I asked numerous times if I could retrieve my stroller, I was told it was impossible to go back, that it would be automatically transferred to Karachi, or that it was in the Lost & Found, and one Turkish Airline attendant even told me they lied to me in Atlanta! Luckily, it reached me in Karachi due to automatic transfer, but at the time, I was stranded for five hours with a squirmy toddler, a heavy backpack, and no stroller! This hip carrier (I saw something similar on Shark Tank!) for a squirmy toddler was very helpful! It had a little seat so I could stand straight while holding my daughter and had a little pocket for my cell phone and passports! On my way back, the new Turkey airport had my stroller right outside the gate. Relief! This hip carrier looks like a fanny pack with a seat and was so helpful! When in Karachi, I think having a pack of straws for toddler to drink out was helpful in keeping her well! Also try to keep little one hydrated, easier said than done! My little one wouldn’t eat much there but she typically would eat a good breakfast (anda toast/paratha with my grandmother’s homemade Guava Jelly) at 4 am quite happily so that reassured me. Also my pediatrician cousin says read the child not the temperature! This quote is helpful when you worry Is my child feverish? Is my child dehydrated? If your little one is playing and seems okay, follow their cues! Try to look out for them yet savor their smiles. Be Prepared for your little one to be clingy- my daughter was clingy in Pakistan as she missed her sisters and father but she also her happy moments so I tried to savor them. Facetiming often with my Nani was helpful because when my baby saw her, she immediately started chattering away to her which was a sweet reunion. Other moments, my daughter would yell NO when she saw her which was bothersome, but we savored the happier moods! Also, with a toddler, jet lag is tricky. 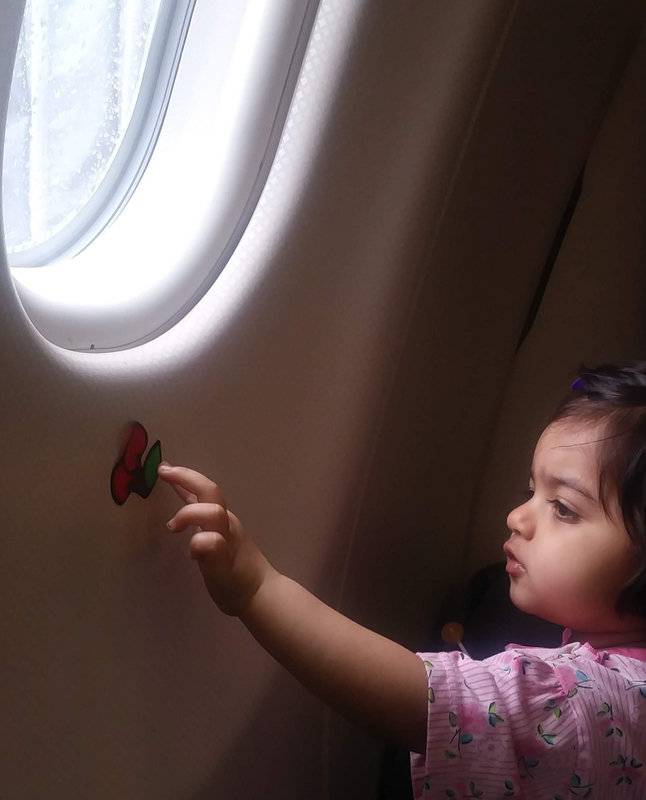 When I traveled with my first baby, she clicked after a few days. However, this time around, My 20 month old was jetlagged for almost 10 days and clicked right before she left Pakistan! The hidden benefit was that she clicked right on American time when we returned. We also got to enjoy peaceful sunrises with praying grandparents and chattering birds due to jet lag! Safe travels and stay well!